This game combines fun entertainment and learning. 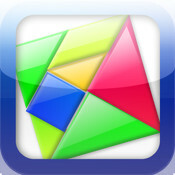 It offers a large number of Tangram puzzles in 3 amazing levels. Use the help function to advance into a higher levels with different challenges. This is a great game for kids 2-6 years to learn motor skills and also to understand and develop geometric puzzles skills. A different Tangram Puzzle and a real brain teaser!